So for the last 5 years since I really picked up woodworking I’ve used a hodgepodge of different benches. At one place it was an old kitchen cabinet with a piece of plywood for a top. Then for awhile I didn’t have a shop so would work on the tailgate of my truck when necessary. For the last two years it was a couple of folding tables in the garage. We’ll that’s all changed now! This bench was originally built by my father in law close to 20 years ago. Well he passed away 5 years ago and the bench has been piled full of stuff since then. Now my mother in law is moving and the options were for it to go or for it to get junked because the spot it was is now going to be the home to the new oil tank. So my wife and I went over a few weeks ago to start disassembling it. What a nightmare. At first we assumed it was just a few carriage bolts. Turns out it was screwed together with wood nailed over the screwed boards. It was certainly solid, but maybe not well built. Took us about 10 hours to disassemble to a point where we could move it out of the basement. So we brought it back to our house and sat it in the garage. Spent a few evenings redrilling and tightening up all the carriage bolts (a few got destroyed in the dis assembly). Once I got it resturdied, I noticed that the original plywood top was done with two different pieces of plywood that were different thicknesses. For what he did with it as a general purpose bench it was covered with a laminate so that wasn’t an issue, but obviously its not good for woodworking. So I popped it off and while it was off took the time to make the 2×4 substructure flat. Hey I’m doing it, may as well do it right (thanks for the support chrisstef). Once it got it as flat as I could get it considering it was all already built and put together, I cut a new piece of OSB for the top (got to put my new grizzly track saw to the test). Put casters on the legs so that it could be moved. Once I moved it to the other side of the garage where it will live, I added the shelving unit. It was originally two shelves plus the top. The original top shelf was super out wack and warped. So I changed it to a single shelf with wider spacing and moved one of the good original shelves to the top. Ultimately not sure if I will keep the shelving unit or if it will be a PITA, but I had the materials so figured it would at least be some extra storage for now. Then I added the top. I used 2-1/4” unfinished hickory flooring. I got about twice the amount of wood that I need, so I ended up covering the underneath shelf as well which had previously been 4 scrap pieces of plywood. I wish I could say that I’m 100 % done, but I’m not. Still have to sand and smooth the top then cover it with BLO. You can’t really tell from the photo, but I didn’t install the final strips of flooring on the top and shelf. I don’t think they will be that necessary until I have vices on the bench, so I’m waiting until I have those since I’ll probably have to add more wood onto the front. Once that part is figured out I’ll be able to utilize the final few pieces of flooring that I have. I may also add pegboards on the sides of the legs for a little bit of extra storage. Its much bigger than I’d originally planned (42”x96” rather than 24”x96”). I am a tall guy so am glad that the bench was originally tall and it should be comfortable (top is 37” off the floor). Not sure what the weight is on it, but I’m going to guess its 500+ pounds and it like a rock. I will probably use one side of the the underneath shelf for wood storage which will add another several hundred pounds of weight…good thing I’m on concrete. Overall very happy with the bench and it should serve me well for a very long time. You are going to get some nice work done on that ! 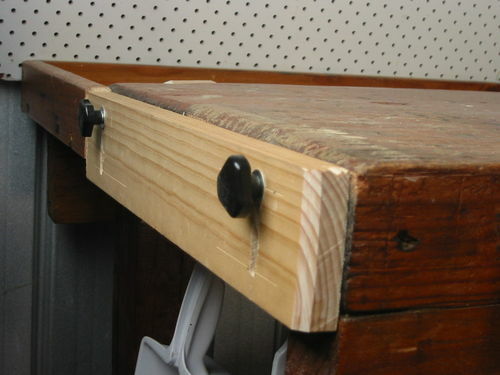 Sounds like maybe moving it was more work than building it from scratch, but the end result is a rock-solid work bench that will give you many years of fine woodworking. I certainly debated whether or not I could have built it quicker and really who knows. What I do know is that it saved me a ton of money. Just for the flooring and some of the other stuff I needed (screws, bolts, casters) I put over $250 into it and that doesn’t include the sheet of OSB that I had sitting around. My guess is that if I had to purchase all of the materials to build this it would have pushed the $400-$500 range. Plus the additional planning and what not time. Sweet Bench Ben. That will definitely be a great work bench for many things. I think you have a keeper there. Just try to use the mantra that I use (and usually never works) “Whatever I take out, I will put away, not leave on the bench”. It works some months…. Thank Kaleb. I’d love to keep it clean. We’ll see what happens. The last couple years I haven’t had real places for things so it’s been hard. I’ll be doing some other organizational things in the coming weeks so hopefully everything ends up with a home. Impressive build! I definitely like what you’ve done. Nice save, my friend. Are those casters bolted on there so you can lift up one end and roll it? BRK—is that just a board held on with knobs that you can raise when you need something to plane against? If so I haven’t seen anything like that, but could be a good option at least until I have a chance to get vices and dog holes. colonel I got stationary casters from home depot that I lagged and carriage bolted on. I am not sure how they will work since I haven’t moved it since I added all the extra weight on there, but the hope is that I can move it (at least a little) for cleaning purposes and because someday it may sit in a different spot in the shop. Maybe later today I’ll try and pick it up, but my guess is it won’t be easy to move (even if the casters are ok with the weight). Very nice looking bech and also very heavy looking. And it is always nice to be able to reuse something that yor Dad made. Pretty much. It works slick on a bench like that. Couple bucks of hardware at the borg is all it takes. Not sure how I missed this but im happy to see you’ve got a new bench in the shop brother. It’s now got lineage to it and that makes it double awesome. That will easily serve you well for another couple of decades. That looks like a good serviceable bench. Congratulations.